and between them they have a lot of excellent ideas. A notch up in quality are the teams who had some but not all of what was needed. a wonderful skyscraper, has little else. reimagines just what urban design can be all about. is will have much more public access than any other tall building in the world. That’s certain, now, and it’s welcome, too. which let light through to a memorial space below – so far, so normal. they’re dotting around Lower Manhattan, in a kind of distributed remembrance which I don’t think really works. You don’t want to keep on bumping unexpectedly into another memorial as you go about your daily life. more as barriers than as entry gates. 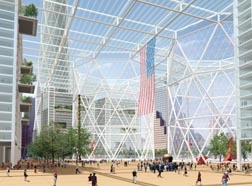 vertical structures that support multiple strata of public and cultural spaces". in shadow, and it’s not going to be a nice place to be. and far from anything which could ever be constructed in reality. approach to the site and somehow made it, as architects, to the final round. put an amphitheatre in one of them. from this particular brief. Again, Peterson and Littenberg ignored the brief. a nice place to be, but it shows very little in the way of boldness or imagination. something that is at the forefront of the other schemes. is a flight of fancy, it could never happen. the building at high speed – what an attraction, and not just for tourists. keeps Foster out of the top two, however, is a certain lack of imagination. which he’s managed to turn into a compelling architectural concept. spirals up and out, into the rest of the site and beyond. of the world", rising in a glorious spike well above the rest of the skyline. PATH and subway trains, but also the point to which the "paths of heroes"
thought out and put in what feels like exactly the right place. in the competition, and come up with a very strong, simple and new idea. out a volume of light. ground level and higher still, up the sides of the new buildings. a whole new public area, 200,000 square feet in all, high in the sky. also be a very impressive addition to the skyline. 11 would want nothing less, for us and for them. It seems like Meier was taking this to be a joke. What EEZ it, man? The thing looks clausterphobic and is an insult to the skyline. The site needs to be monumental and truly impressive for the entire world to see. The buildings need to be lean and gorgeous, with grace and strength. The “twinned tower” is lovely, but it seems almost too high and does not work with the surrounding buildings. God knows I’d never go to the top… I’d faint at about the 75th story anyway. 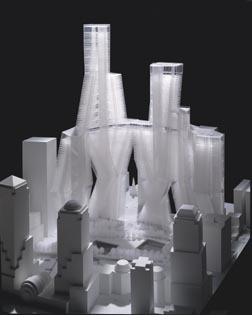 The Liebeskind plan seems fabulous. Aesthetically rich, with twist and turns – like a tango for buildings. I like the pointy tops of the towers, something you could see from far away. The presentation has an organic feel by including gardens, which to me, represent life. This space has to be an uplifting, special area that will draw businesses and visitors in… something that symbolizes strength and sophistication that is truly New York City. New York City is a dream to so many people. It symbolizes success. 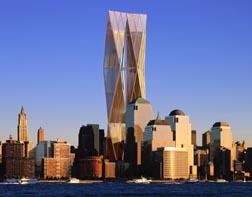 The WTC site should represent respect for those who perished, of course. But it also needs to send a clear message to the world that New York is still a beautiful and sophisticated town that is unlike any other city. Gotham. up to play frisbie with their dog in the park. top started tilting before it fell. giant posters of the leader on buildings. dwellers from the lack of sun. my complaints, but they aren’t handy. PS: what was that word you used in your explanation of why we not be getting our usual “tchotkas” this year for Christmas? I have a great vision for the WTC : GATEWAY LANTERN concept for the world to share. 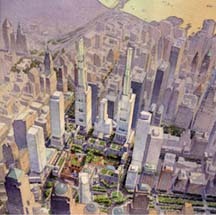 You can visit http://WWW.CHAI.TV with many of my fabulous design sketches of the CHAI VISION proposals. from his original oil painting of a floating “giant lantern” in the sky. the landscape of the Lower Manhattan city skyline. of humanity from man-kind dedicated to world peace. different departments of the towers. architecture of the new millenium. window views to the city. with ceremonial square and memorial precincts of the Lower Manhattan city harbour. objectives set down by the Lower Manhattan Development Corporation (LMDC). connection to other open space which leads to the Transit Centre. Soft landscape with trees and greeneries will give a new life to the city growth. a place for national gatherings, celebrations and aspirations. victim in order to honor those who died. The glass roofs can be light-up at night with a crystal diamond effect. promenade of the tower footprints to give youthful energy. The red colour is choosen in the series of the supporting columns. steel materials emerged from the destroyed Twin Towers. life and meaning, a living symbol of survival, new hope and world peace. Liebeskind may have done his work too well. He has, I think, achieved the impossible unity he sought. Indeed, in this unity, the tragedy and vitality and symbolism are intensified. They seem to resonate with one another. My question, “How will people live and work with the intensified pain and memory so present, so alive?”. The answer may be, “Better and more passionately and more compassionately and more creatively than ever”. 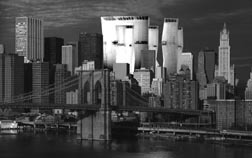 The World Trade Center should be replaced with new United Nations buildings, suggests Robert Urbanek, editor of the paranormal web site Nine Eleven Newsline (www.911newsline.com). The United Nations Secretariat building is in a serious state of disrepair and will cost more than $1 billion to update. In keeping with the space theme, Urbanek proposed that the new UN Assembly Hall should be in the shape of a dark saucer. ÏThink Independence Day,Ó he quipped. Might be silly, but how about moving the rebuilding project to a corner of central park swapping for a memorial park on the WTC site? Might make everyone happy. 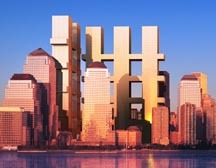 Why not make three buildings. Two at 111 stories, and one at 90 stories. This would represent 911. 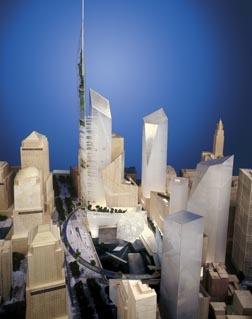 Here is a unique design that I created for the proposed WTC site. I say you just build a nice garden, in that steel and concrete hell you’ve created, it would be nice to glance up and see the sun. look at the terrorist attacks as a 2nd chance to better something that couldnt have been done so otherwise. dont try to make something bigger and better just for the sake of doing so, but try to make something beautiful and something that will benefit nature, which has been forgotten in that city of greedy-money-grabbing cowboys.